Lots is said about Autism Mums. You know the things I mean.... they are put into cute or inspirational pictures and posted on Pinterest and Facebook. "I'm a Mom with a black belt in Autism", "An Autism Mom does better research than the FBI", and then there's the list of "Reasons you should think twice before messing with an Autism Mom". These are all fine, some are funny, some are true. But sometimes I feel like the Autism Dads miss out on a bit of credit that they deserve. Maybe it's because more mums are blogging about Autism? 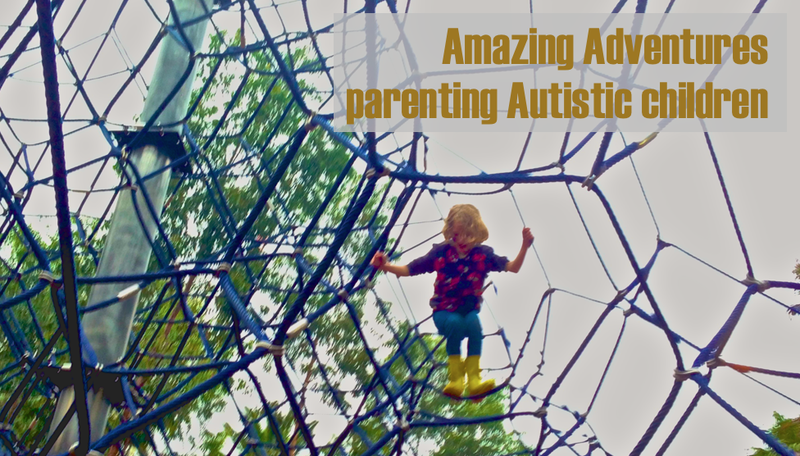 I can only think of 4 Dads out there who are being vocal about their experiences raising Autistic kids, but I know of too many Mums to count who are in the public eye, putting their experiences out there for all to see. 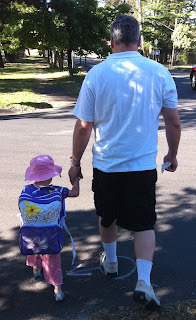 So, this Fathers Day, I am going to write about the Autism Dad in my household. Because I think he is a hero. His story is likely not unique, but it is one little told. So, here I go. My Wonderful Husband is also a Wonderful Dad. Of course he goes to work as a nurse, and he is a financial provider for our family. He is many other things, too, but Husband and Father are the two roles in which he really shines. He is the guy who steps in whenever he is needed. He'll get home from a long day at work and offer to cook dinner because he knows I am tired too. He is the guy who gets up at 11.30 at night and goes to pick up kids from the train station after they've been on a drama performance excursion, even when he has to be at work by 7 the next morning, just to save me from doing it. He is the guy who goes to the shops on the way home from work to get bread and milk (and something special for the kids) so I don't need to leave the house, even though it is out of his way and he just wants to sit down for a while. He is the guy who works night duty on weekends once a month so we have extra money to spoil the kids with a special trip out every now and then. He is the guy who helps me unload and reload all the bookshelves without complaining when I have a hankering to rearrange furniture, even though he thinks I have too many books. He is the guy who makes a point to spend his days off giving me a break from the intensity of ASD even when he could use some down time too. And you know what else? He does it all while living with his Bipolar Disorder and the treatments he needs to manage it. I have noticed over the past few months in many places people talking about the link between Bipolar and Autism. I'm not sure if the scientific community knows much (I should do some reading), but I do know that more parents of Autistic children are opening up and saying that they have Bipolar Disorder. Much like Autism, Bipolar is something that you can't really explain well to someone who hasn't experienced or lived with it. My Hubby manages his symptoms so well that most people are unaware that there is anything different about him. But this does not mean that living with Bipolar is an easy thing for him. My Hubby takes numerous medications that help stabilise his mood. He only started taking them as an adult, and he was fully informed of the side effects and risks. At the time he decided to start treatment he was so desperate to get control of his life that he chose to risk it. He lives daily with the side effects now (nausea, increased appetite, weight gain, tremors, constipation, diarrhoea, low blood pressure, head spins, dizziness, severe oedema, sexual disfunction, somnolence/sedation, difficulty concentrating and decision making, sometimes sore liver, liver dysfunction) and he has regular blood tests to monitor the function of just about everything in his body, yet he STILL prefers to swallow those pills every day- he says he'd rather live a shorter life and be of use to me and the kids and be able to work and maintain a sense of purpose, than not take them, be free of side effects and totally useless to anyone for at least half the year every year. To me- that makes him a hero. So, this Fathers Day, I want to thank my Wonderful Husband, who puts other people in front of himself everyday and who deals with so much and works so hard to be the amazing man that he is. And I want to thank all the other great Autism Dads out there who are like my Hubby. You guys might not feel like what you do means much, but I'm telling you, it does. Happy Fathers Day. A hero indeed! A beautiful tribute, Michelle, for an amazing guy! He does indeed sound liek a good guy. Well done him. And all the other autism dads who are dealing with a lot more than the average bloke on the street. Must remember to be nicer to my husband now!